Republican Senator Rand Paul publicly tweeted that high-profile members of the Obama Administration should be investigated for efforts to prevent Donald Trump’s presidency. The allegations are ludicrous on their face, but they also shine a light on Rand Paul’s pro-Kremlin tactics and motives. Senator John McCain (R-AZ) first promoted the notion last year, publicly, from the Senate floor. The Senator from Kentucky has actively worked to further the objectives of Russian President Vladimir Putin. For his troubles, it’s time for Congress to investigate Senator Rand Paul for his connection to Putin and Russian oligarchs. News broke Thursday morning that Attorney General Jeff Sessions, at the behest of Donald Trump, will open an FBI inquiry into whether or not Hillary Clinton violated any laws related to the now widely-debunked Uranium One fake news scandal. Those in need of an explainer on this faux-controversy can enjoy political commentator and TV personality Joy Ann Reid brilliantly taking down the whole conspiracy theory in one minute flat. No need for a Congressional probe, y’all. We got it covered. The news comes as part of a broader, coordinated media push by GOP leaders, members of Congress and the White House to delegitimize and distract from Special Counsel Robert Mueller’s investigation into Russian interference with the 2016 presidential election and the extent to which the Trump campaign conspired with a foreign hostile power to influence an American election. Time to investigate high ranking Obama government officials who might have colluded to prevent the election of @realDonaldTrump! This could be WORSE than Watergate! The switch and bait campaign is so transparent it might be laughable if it weren’t so alarming given Senator Rand’s recent record. Since Donald Trump’s inauguration, the senior Senator from Kentucky has acted in ways that suggest he is in cahoots with the same Russian oligarchy that seem to have a stranglehold on the executive branch. In June, the United States Senate voted nearly unanimously and with bipartisan support for additional sanctions to be placed on Russia as punishment for interfering with the 2016 presidential election, annexing the Crimea region of Ukraine, and its support of the Syrian government during its ongoing civil war. Yes, despite the line you might hear them take on Fox News or in the media, even most Republican senators quietly acknowledged the need to respond to what was an obvious attack on American democracy and supported the sanctions. Only one Republican voted against the bill. Senator Rand Paul of Kentucky. In recent days, whispers have grown to a fever pitch both in Washington and on social media that Donald Trump intends to fire Mueller before Christmas. Congressional Republicans and the White House have begun what appears to be a campaign to ouster Mueller by impugning his integrity and questioning his ability to fairly adjudicate the investigation. If true, the firing would constitute such a obscene and grave obstruction of justice to the American electorate and the rule of law itself that organizations like March for Truth have organized a massive nationwide Rapid Response Effort, promising to take to the streets across the United States. Chiming in to the chorus of Republican voices now adopting this strategy was none other than Senator Rand Paul, the senior Senator from Kentucky. Mr. Paul made headlines on Thursday morning when he publicly called for a federal investigation into the conduct of Obama-era administration officials and efforts to allegedly prevent Donald Trump from taking office following the 2016 presidential election. The bombshell tweet seems to have no factual or evidentiary basis. Misinformation as a strategy is not new for the GOP, who has made their political backbone on a foundation of lies over the past twenty years, maybe longer. But this coordinated assault on truth is something new. And distinctly sinister. And borrows from very well-established propaganda tactics used by Russia for a very long time. Fact: The Russian Government is currently involved in an all-out information war on the United States of America and other Western democracies. It is well-organized and well-funded. [Russia] uses a network of officials, journalists, sympathetic commentators and internet trolls to create an alternative reality in which all truth is relative, and no information can be trusted. …Its propaganda largely relies on four tactics: dismiss the critic, distort the facts, distract from the main issue and dismay the audience. Finally, it relies heavily on the Kremlin-controlled media, and paid or sympathetic commentators in the West, to pass its messages. The Russians use a tactic known as the 4D approach to spreading misinformation: Dismiss, Distort, Distract, Dismay. Donald Trump’s entire administration has built upon this model, constantly skewering former President Barack Obama and the people’s President, Hillary Clinton for the very things he himself is guilty of. Senator Paul’s tweets of late fall squarely within this model. The solution? The folks responsible for StopFake.org are come from the Mohyla School of Journalism (LWC), a Ukraine-based academic institution dedicated to ending the proliferation of fake news. Their advice for the west? The West should respond by emphasizing its own narrative of the freedom of choice and democracy, values which are threatened by the Russian regime and seen by it as a threat. This is an area where the states of CEE can play a leading role. 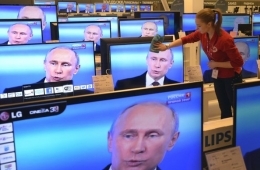 Further, the West should publicly identify the key Russian tactics each time they are used, and expose the Kremlin’s network of paid commentators and pseudo-journalists for what they are. Don’t take out word for it. Here’s Republican senator John McCain on the floor of the United States Senate saying the exact same thing in March after Senator Paul inexplicably blocked a vote which would allow Montenegro admissions to the United Nations, a move seen as exclusively pro-Kremlin interests and completely void of any logical basis otherwise.